Photo taken on June 26, 2017 shows a container cargo ship in Panama City, capital of Panama. A year after inaugurating the expanded Panama Canal, Panama is looking to consolidate its role as the "logistics hub of the Americas" with more infrastructure projects, said the waterway's top official on Monday. 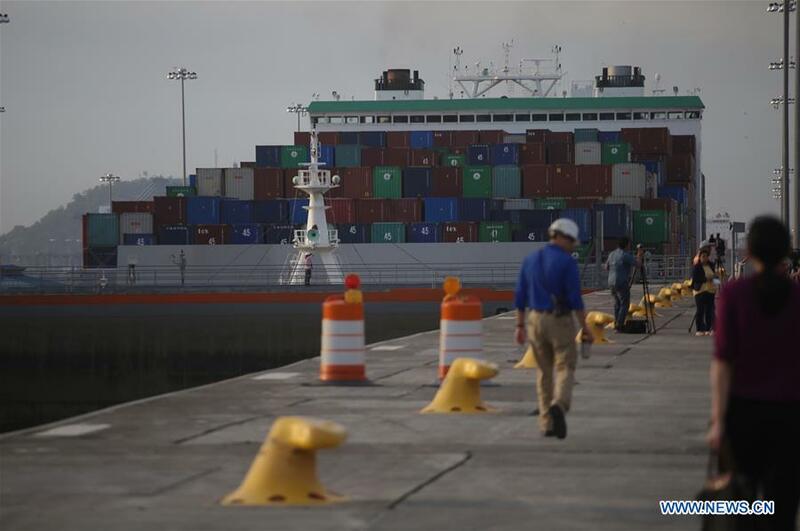 PANAMA CITY, June 27 -- A year after inaugurating the expanded Panama Canal, Panama is looking to consolidate its role as the "logistics hub of the Americas" with more infrastructure projects, said the waterway's top official on Monday. In marking the first anniversary of expansion of Panama Canal at a ceremony on Monday, the CEO of the Panama Canal Authority (ACP), Jorge Quijano, said the accomplishments in the expansion have exceeded their own expectations. "Looking forward, the next decade will serve as a significant next chapter in the Panama Canal's story as we continue to advance various infrastructure projects within the region to further position Panama as the logistics hub of the Americas, for the benefit of our customers, and for the people of Panama," added Quijano. The ACP said in a statement that there are four proposed projects designed "to provide greater connectivity and transshipment opportunities to the region." The four projects include a roll-on roll-off (RoRo) terminal to accommodate the redistribution of vehicles, machinery and heavy equipment; a 1,200-hectare logistics park to further strengthen logistics services in the region; and an LNG (liquefied natural gas) terminal on the Atlantic side of the waterway to provide LNG bunkering and redistribution capabilities and advanced plans for the Corozal container terminal. The ACP said the Panama Canal tonnage has increased by 22.2 percent compared to the last year and set both daily and monthly tonnage records. The expansion was intended to accommodate today's larger Neopanamax container cargo ships. And more than 1,500 of such vessels used the waterway last year.